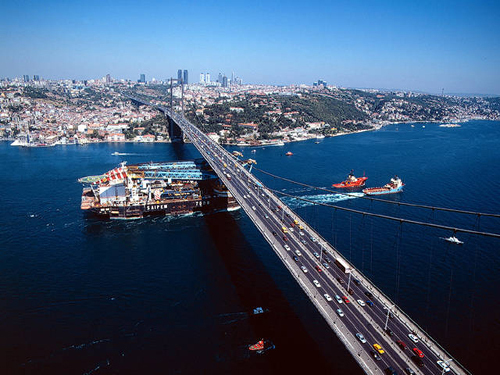 As you may already know, Istanbul is a city divided to two parts with a strait and connected by two large bridges, Bosphorus Bridge (1973) and Fatih Sultan Mehmet Bridge (1988). The Bridge they show you almost every episode is the Bosphorus Bridge (Bogaziçi Köprüsü). Here are some pictures of it. While a big ship is passing underneath the bridge. This word is used when you're thanking someone and when you're bidding someone good bye, both in informal situations. There was way too much food talk involved in this episode. And I watched the episode at night with an almost empty stomach. Poor me :) Anyways, you may want to know what they are and perhaps try it at home. But I warn you, some of these things can be addictive! Mezze (Meze); is a selection of small dishes served in the Mediterranean and Middle East as dinner or lunch, with or without drinks. 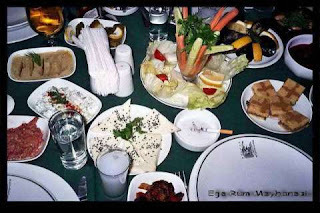 In Turkey meze is served with raki, or rather, raki is served with meze. They just complete each other. 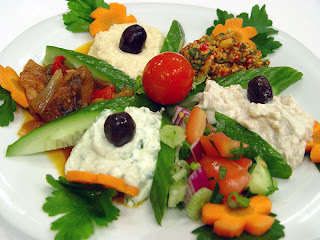 Olive Oil Food: Food (generally vegetables) cooked with olive oil. 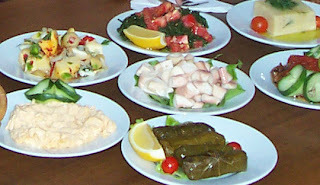 Especially in Mediterranean and Aegean parts of Turkey, people just love olive oil and cook almost everything with it. In Episode 15, Mukaddes says she's great at olive oil foods and she accepts that task to help Erol Bey's restaurant. Pumpkin dessert: As the name hints, it's a dessert made with pumpkin. I'm not sure if it's common in other parts of world, but here is how we make it Turkish style. Dolma (Stuffed vine leaves): Vine leaves stuffing ingridients generally consist of rice, onion, parsley, herbs and spices. Daily, casual kiss between friends or family members, consist of a kiss on each cheek. I think this is common in most Mediterranian countries. Though most of the time lips don't even touch the cheeks of the person we're kissing, so it's actually cheeks kissing each others. And on the phone, we say (literally) "I'm kissing you" or "I kiss you". This is way of showing love to the person we're talking on the phone. Since we can't be there and actually kiss that person, all we can do is sending kisses through the phone with words. In some parts of Turkey, people (especially the women) can't get married without their parents' (or grandparents', in some cases) approval. They can only get married to the person their families approve of. Asu (disguised as Enise) makes up that story to make Emre stop calling her. She says that her family is giving her to someone else, meaning her family gave their word that Enise will get married to another guy, regardless of Enise's feelings and will. Sadly this still happens today in certain parts of our country. Young girls are forced to marry people they don't even know. Their families are deciding for their childrens lives and future without asking them what they want even once. Like "Eyvallah", this too is a word with two different meanings. The other meaning of Efendim is actually a question word. When somebody says something to you which you didn't quite get, you ask "Efendim?". It means something similar to "excuse me?" in this case. But "Efendim?" as a question word is also how most of us answer phone calls here in Turkey, instead of Alo (Hello), regardless of who is calling. I think this was all for this episode, let me know if I missed anything. Thanx a lot!!!! the food looks great. 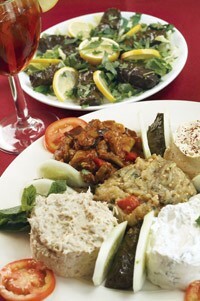 I like the Middle Eastern style of food, though it takes much time and effort, and the Turkish looks like it a lot. I´m from Spain, here too cook with olive oil ever, and we also give two kisses to say hello. We say on the phone I send you a kiss or kissing, funny how two countries so far have similar customs, will be for the Greco-Roman´s culture. Thanks and kisses. Very interesting and informative as usual. Happy new year. Very enlightening! Thanks for the great effort. 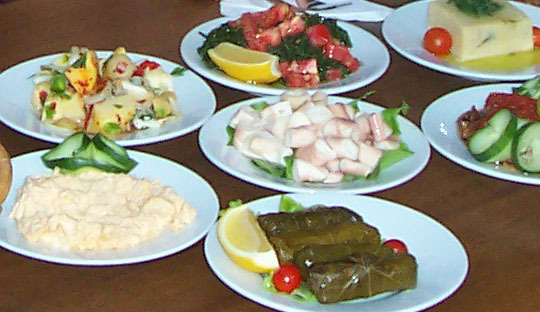 Turkish, greek, Lebanese and many arab countries have very similar food. Thanks for these notes, Erkan and Melek. The notes and photos are wonderful. I loved coming home to Uskudar from work on the European side because at night the Bosphorus bridge has lights that change color every few seconds. It's so beautiful to watch. As for Turkish food, it is unspeakably exquisite - so healthy and pure and so delicious.Turkish cuisine is considered one of the finest in the world. I've been back in Canada for 3 years and i can't eat the food here and everyday i dream of turkish food. 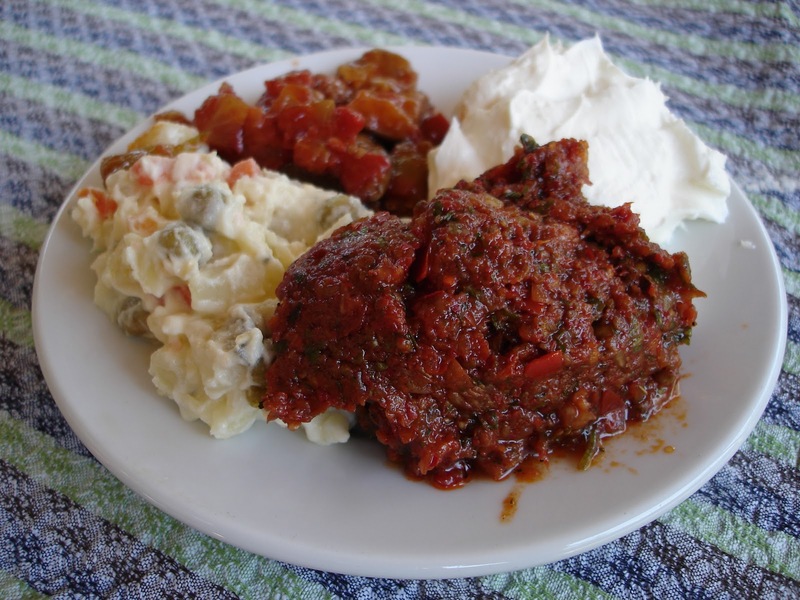 There are now cooking classes for tourists who come to Istanbul and want to learn more about this and the classes are often offered by very good chefs. 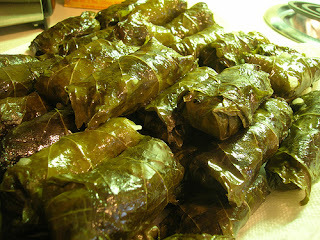 I pray that turkish women don't start buying packaged and prepared foods there. is all turkish television stations in Istanbul ? The food looks delicious, i never had pumpkin dessert before, will look for the recipe. Thank you. Thank you for the great notes. I never commented here before but i really enjoy reading your notes' posts and the translated bolums. I ve heard that Fatmagulun sucu ne? would end after two weeks yani the first season. Is this true or they only rumours? Thank you for the translation and the notes. You're doing a great job. I am Spanish, and the food here is quite different, although we also use olive oil, and we kiss twice each other when we meet. 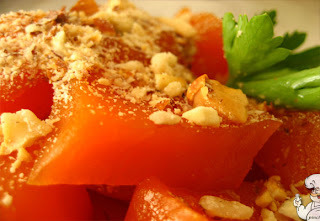 I think I'm going to prepare the pumpkin dessert, because it seems really good, and very easy. 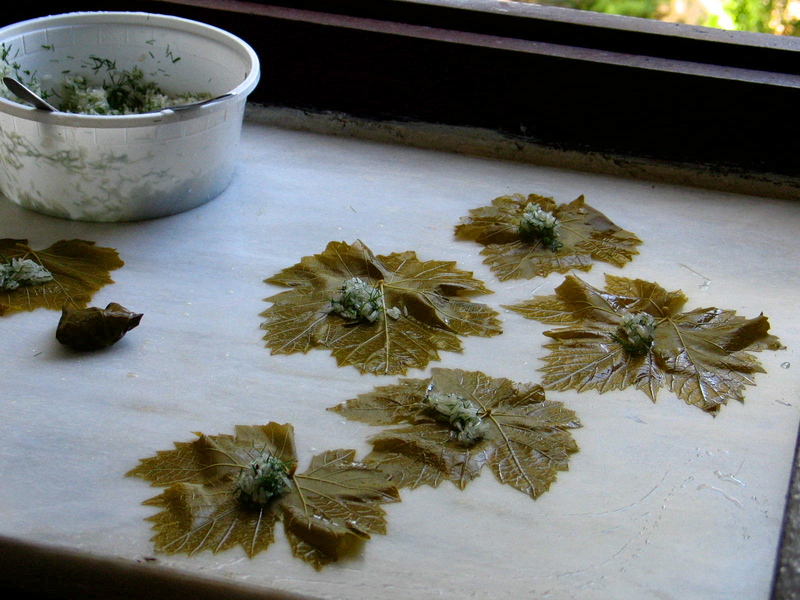 Here in Spain we've never thought about preparing some food with the vine leaves. I found it quite bizarre, but tasty, anyways. Thank you again, greetings and thank you again. hope 16 will be out soon! am eagerly waiting for it checking the site every 5 minutes! It'll be out soon, in between two or three hours. More than half of first part is complete. It'll take a while to finish it and upload the subtitles etc. Ya, I think I'll taste it as soon as I can, definitely. first of: a million thank yous for your selfless dedication..these notes are so intriguing I can't get enough of them. As I said before my family & I have visited Turkey on numerous occasion & needless to say that each time we came back from our little visit with pound & pounds of extra weight..yes I kid you not, we'd have to go on diet just to loose the weight we'd gained eating none stop in Turkey.